One of my previous posts discussed a recent study on New Zealand’s only endemic spider regarded as dangerous to people, the katipo. I thought readers might be interested to learn a little more about what’s behind the bad reputation of katipo and its’ close relatives. As I said then, katipo belongs to the genus Latrodectus, a group of spiders that includes infamous species such as the black widow spider (Latrodectus mactans) and the Australian redback (Latrodectus hasseltii) amongst its ranks. The cliché that ‘the female of the species is deadlier than the male’ applies here as the male is very much smaller and incapable of biting through human skin. Latrodectus venom contains potent neurotoxins capable of putting an adult in hospital and in some cases may even fatal. While fatalities are rare, a bite from one of these spiders can be EXTREMELY painful and deeply unpleasant. The symptoms are many and varied, but pain, particularly in association with severe abdominal cramping is common. Not all bites are necessarily the same. The age, health and size of the victim as well as the amount of venom injected are just some factors that can influence the severity of a bite. In New Zealand, katipo bites are very uncommon. For one thing, katipo prefers to run rather than bite. For another, katipo is nowhere near as widespread as it used to be as humans make more and more changes to the beach-front habitat katipo prefers. While there are parts of the country where katipo exist in good numbers, your chances of meeting one are small and the chance of being bitten by one smaller still. 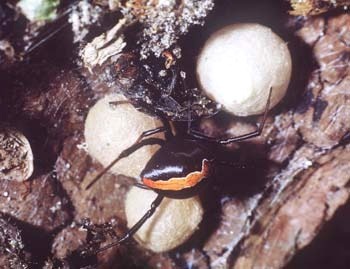 Even if you defied the odds and were bitten by a katipo, your suffering is likely to be less severe than if you were bitten by another species such as black widow. This is because katipo is the smallest Latrodectus species and thus delivers the least amount of venom when biting. Nonetheless, a good dose of katipo venom is probably going to have you feeling very sorry for yourself. Fortunately, New Zealand hospitals carry suitable anti-venom. There will be more on the subject of Latrodectus in my next posting, including where I found the word ‘lethiferous”. Almost certainly it will be nothing to worry about. The two poisonous spiders we have are katipo and redback. They don’t really behave in the way you describe (webs appearing overnight in your backyard). Katipo is also very unlikely to live around homes and while the redback can, unless you’re in Central Otago it’s unlikely you have one of these. thanks for the information made available online. I have been searching for any information on spiders in nz due to the appearance of webs appearing overnight in our back yard. I have been searching for the identity of the spiders to ensure that the children are safe to play around the webs. i like that the information was brief and to the point. Some big words that the common people like myself have no understanding but the rest is very eye-opening.